You are probably familiar with the Rule of 72, which tells you when the one dollar you invest today will be worth $2 once you have a rate of growth. If your annual rate of return is R%, then it will take you (72/R) years to double your money. For instance, for a 6% return (assuming the rate is constant), you will need 72/6 = 12 years to see 100% gain of your money. The math is quite straightforward and can be done easily with Excel. But if you don’t want to do the “dirty” work yourself, then the following plot is provided for your convenience so you can have an idea on how long and how fast you should go. 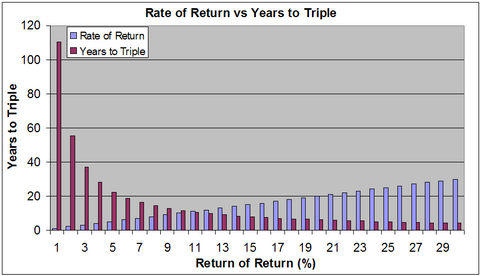 Note that the number of years to triple is smaller than the rate of return (without the percentage) once the return rate reaches R = 11, at which point, you only need ten and a half years to earn two dollars for every dollar invested. So we know which rate can give us a reasonable time frame to triple our money. The next question is how we can achieve that goal. That is, where can we find that 11% annual return to help us to earn 200% return in a little over ten years? In the May issue of Kiplinger’s Personal Finance magazine, an article, Triple Your Money, asks and answers this very question. Using historical data from 1926, the article points out that investors can expect to earn 200% return in 11 years by investing in US stocks, which on average returned 10.4% since 1926. The following is a re-produced plot from the article, showing average returns of some major investment vehicles (30-day T-bills for Cash) and the corresponding years to triple. There criteria, except the last one, are chosen such that small investors can participate without having to pay big fees. The search returned just 24 funds that meet the above requirements and, not surprisingly, they are all in the three hot categories of the past several years: real estate, precious metal, and foreign stocks. 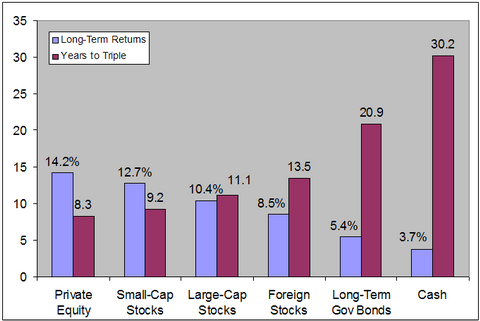 The way I look at these funds (or the fund categories) is that they are important ingredients of a healthy portfolio, but I won’t bet big money on any of them just because they have returned nicely over some 5+ years (here are some discussions on asset allocation and real estate investment). I’d love to see my money triple in five years, but I also want a good sleep every night without worrying what will happen to my money tomorrow. And since they all performed incredibly well since 2001, easy money may have already being made. Therefore, some cautions are needed when weighing your options on when to get in and what to invest. On another note, the theory of tripling your money for a given rate of return is based on the assumption that the investment is made at the beginning of the period instead of a gradual but regular approach. If you do dollar-cost averaging, you will need much longer time to see the 200% return (here’s why). The reason is that all three categories are in a bull market for some time and every time you made a purchase, the shares were likely to be more expensive than what you paid last time. American Eagle Gold Coin in Short Supply? This is a fantastic article Sun. Thanks for covering it. Very impressive info here… I need to check this out and apply this to my own investments. Looking at RateLadder’s Prosper gains spreadsheet, it seems like some lenders (including myself) are making 11% or better. I don’t know if I would go with the hot categories in the long term. The exception is foreign stocks. I think there’s lots of room left to run there. I think the next ten years should be big for health care as well. I believe precious metals are over-priced, but I have been wrong before. Awesome fund layout. Also, you can use the rule of 115 to calculate how long it will take an investment to triple. TJP: Thanks for the tip. I have include that information in the post. I thought there must be some rules to get the number, but didn’t really search for it. I’m impressive, I can bookmark the lookup and do it myself without consulting a professional. One more thing I love about blogging –good resources. Nice tips, I will bookmark this site. I’m invested heavily in asian funds…let’s all root for the market to go back up!